Series Name: The Girl From U.N.C.L.E. 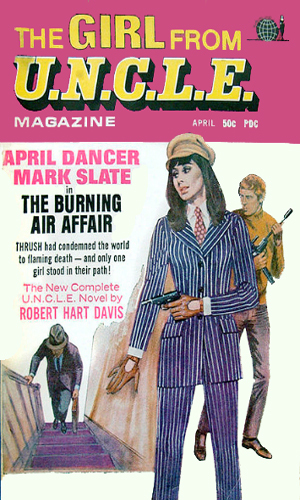 April Dancer is an agent with U.N.C.L.E. April Dancer is a medium height saucy brunette with the appealing figure of 34-22-34. She is 24 years of age at the start of her time with U.N.C.L.E. having just graduated from Radcliffe. Whether she entertained the thought of a life as a field agent for a clandestine organization is not known but her aptitude in the myriad skills such an operative would need lends credibility to the idea that if she had not aimed for it, she still fit in perfectly. The child of parents who "served in the government" (exact meaning unknown), Dancer went with them on their many and varied postings around the world. She literally grew up a child of international scene. Her intimate knowledge of a large number of varied languages vouches for this and shows that she learned to quickly absorb the dialects of any area she and her family landed. This lack of any sheltered life works greatly to her advantage as she feels comfortable in virtually any region she lands be it the fancy shops of London and Paris or the back street bazaars of the Middle East. Dancer is a gifted athlete as well. She owns a black belt in judo and is close to earning one in karate. Her skills with a gun are almost legendary in the U.N.C.L.E. Academy where her marks put her near the top. She can field strip a hand gun or a rifle in the dark and put it back together without hesitation and she has shown on more than one occasion that if pressed, she can shot to kill. Despite the skills, though, she retains a distaste for taking a life and does so only when forced. In addition to the standard weaponry fare, Dancer is 'armed' with trick apparel, including a bra which unravels into a thin but strong climbing wire. A love of racing is also in her blood and she has competed, unofficially, against some of the best drivers in the world. This is useful when she has to contend with traffic in places where the rules are only suggestions. She also is qualified to pilot a variety of aircraft and does so for relaxation. When Dancer was first out from the Academy, she was paired with a retired agent brought back to teach her the real world ropes. After a short time, he gave his nod of approval and withdrew, being replaced by a much younger agent named Mark Slate, a dashing, hip British agent imported to the New York office from London just to be paired with Dancer. The two hit it off perfectly from the beginning and though many thought the two might become romantically attached, they instead became like a family. Dancer is most interesting because she is a talented and dedicated agent who has nothing to prove to anyone, an agent who knows she is good and still getting better. There are five books in the series. 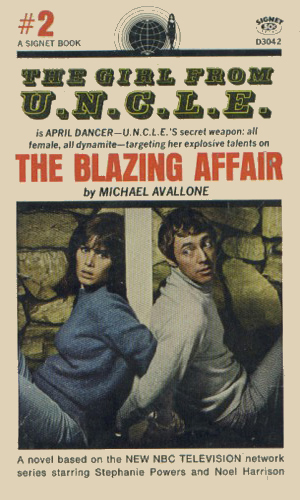 The first two, written by Michael Avallone, were published in America by Signet, unlike the Man From UNCLE books which were put out by Ace. The remaining three books were published only in England, never making it into America. Needing one of their agents released from U.N.C.L.E. control, Thrush kidnaps Mark Slate and promises to dispatch him with prejudice unless a swap is made. Trying to find him, April herself becomes a prisoner and now the two of them must get free before Waverly has to give in. The evil of Nazi Germany is rising again in the form of the criminal group calling itself TORCH. The task of tracking down its origins, finding out its membership, and closing down its operations falls to Dancer and Slate. April and Mark are dispatched by Waverly to check out the strange going-ons on the African island of Taradata where Thrush is hatching yet another nefarious plot. The murder of an U.N.C.L.E. 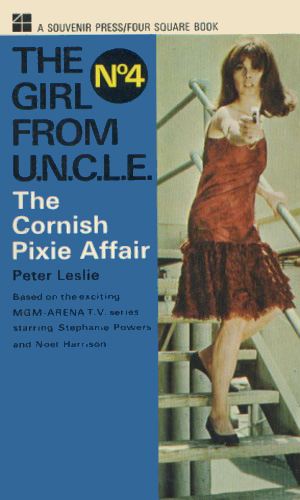 agent in Cornwall brings April to that region working undercover in a circus troupe to find out why people are so interested in pixies made of black porphery. For some reason tin dresses on Carnaby Street is connected to a plot to destroy the world's monetary system and April must figure out how. 1st of 9 stories in The Girl From U.N.C.L.E. Annual 1967. [plot unknown]. 2nd of 9 stories in The Girl From U.N.C.L.E. Annual 1967. [plot unknown]. 3rd of 9 stories in The Girl From U.N.C.L.E. Annual 1967. [plot unknown]. 4th of 9 stories in The Girl From U.N.C.L.E. Annual 1967. [plot unknown]. 5th of 9 stories in The Girl From U.N.C.L.E. Annual 1967. [plot unknown]. 6th of 9 stories in The Girl From U.N.C.L.E. Annual 1967. [plot unknown]. 7th of 9 stories in The Girl From U.N.C.L.E. Annual 1967. [plot unknown]. 8th of 9 stories in The Girl From U.N.C.L.E. Annual 1967. [plot unknown]. 9th of 9 stories in The Girl From U.N.C.L.E. Annual 1967. [plot unknown]. 1st of 8 stories in The Girl From U.N.C.L.E. Annual 1968. [plot unknown]. 2nd of 8 stories in The Girl From U.N.C.L.E. Annual 1968. [plot unknown]. 3rd of 8 stories in The Girl From U.N.C.L.E. Annual 1968. [plot unknown]. 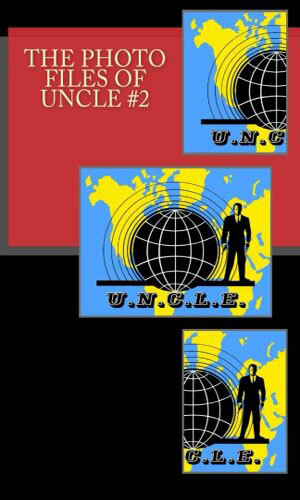 4th of 8 stories in The Girl From U.N.C.L.E. Annual 1968. [plot unknown]. 5th of 8 stories in The Girl From U.N.C.L.E. Annual 1968. [plot unknown]. 6th of 8 stories in The Girl From U.N.C.L.E. Annual 1968. [plot unknown]. 7th of 8 stories in The Girl From U.N.C.L.E. Annual 1968. [plot unknown]. 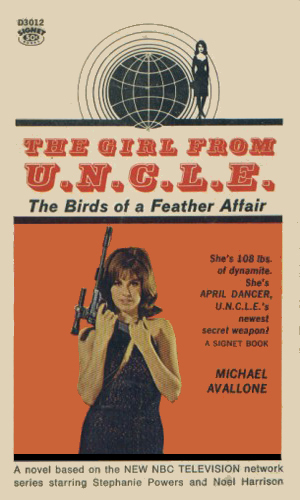 8th of 8 stories in The Girl From U.N.C.L.E. Annual 1968. [plot unknown]. 1st of 7 stories in The Girl From U.N.C.L.E. Annual 1969. [plot unknown]. 2nd of 7 stories in The Girl From U.N.C.L.E. Annual 1969. [plot unknown]. 3rd of 7 stories in The Girl From U.N.C.L.E. Annual 1969. [plot unknown]. 4th of 7 stories in The Girl From U.N.C.L.E. Annual 1969. [plot unknown]. 22 A Puzzle For U.N.C.L.E. 5th of 7 stories in The Girl From U.N.C.L.E. Annual 1969. [plot unknown]. 6th of 7 stories in The Girl From U.N.C.L.E. Annual 1969. [plot unknown]. 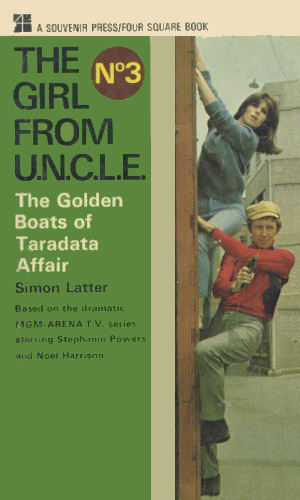 7th of 7 stories in The Girl From U.N.C.L.E. Annual 1969. [plot unknown]. Published by World Distributors. Contains 9 text adventures and 1 comicbook adventure plus assorted other items. 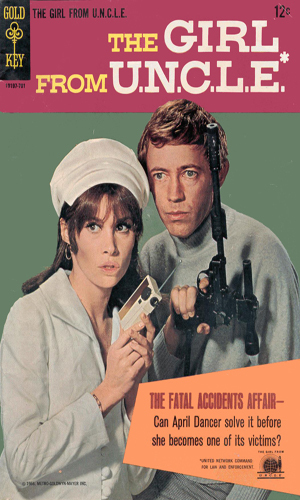 The Fatal Accidents Affair, reprinted from The Girl From U.N.C.L.E. #1 from Gold Key. Published by World Distributors. Contains 8 text adventures and 1 comicbook adventure plus assorted other items. The Kid Commandos Caper, reprinted from The Girl From U.N.C.L.E. #2 from Gold Key. 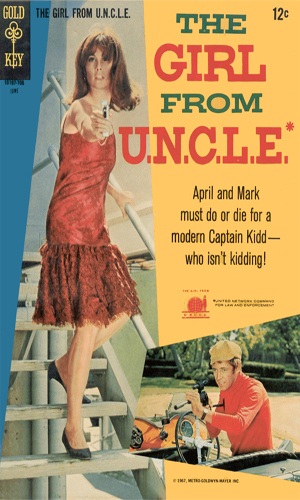 The Captain Kidd Caper, reprinted from The Girl From U.N.C.L.E. #3 from Gold Key. 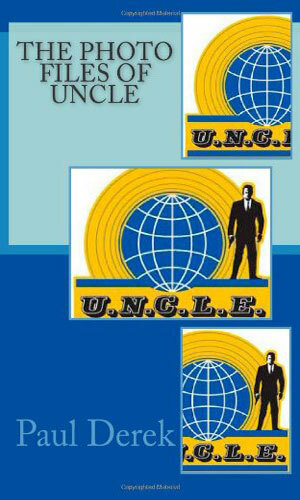 With the success of The Man From U.N.C.L.E., NBC, the network carrying the series, decided that a spin-off was in order. The producer, Norman Felton, was asked to create another show but this one was to be centered around a female agent. According to legend, Felton went along with the idea but not with a lot of enthusiasm which clearly shows in the results. The original premise of the offshoot would be that an aging agent, Mark Slate, forced into retirement by passing the mandatory retirement age of 40, is asked to help train a young female agent. 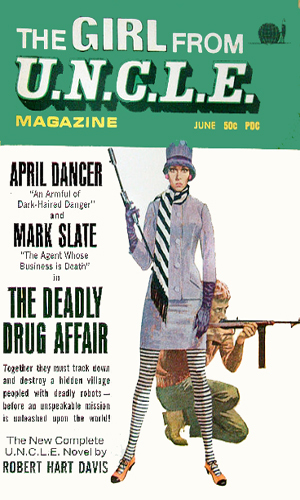 Slate was the man who had broken in Napoleon Solo and was grateful for a chance to remain in service. The episode in The Man From U.N.C.L.E. in which this took place was The Moonglow Affair. 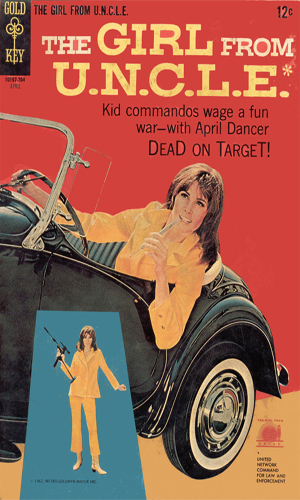 It starred Mary Ann Mobley, former Miss America, as April Dancer and Norman Fell as Mark Slate. When the green light on the new series was given, a few changes were made. The character Mark Slate was made considerably younger to make him appealing to young viewers. Additionally, the actors playing both leading roles were changed. 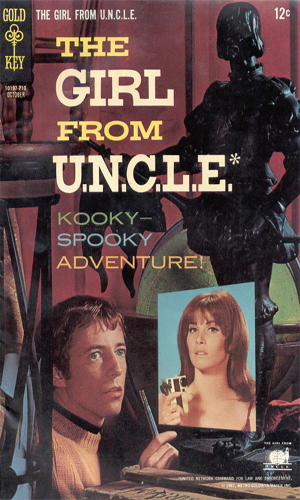 Stephanie Powers was the new April and Noel Harrison got the nod as Slate. This show was considerably different that its sire. It took a great deal from the popularity of the campy Batman and became just as full of camp. The plots were far more outlandish than MfU, which is saying something, and the dialogue was far hipper. Most of the fans of MfU were not as enthusiastic. The show lasted but one year, running from September, 1966 to April, 1967. In all, only 29 episodes were made. 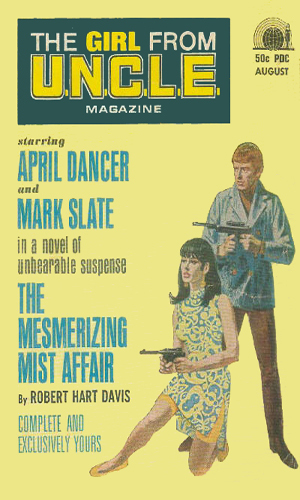 Whether it was intentional or not, the relationship between Dancer and Slate bore a considerable amount of similarity to Modesty Blaise and Willie Garvin. It was a shame that the quality of the plots and the writing were not of the same caliber. Interestingly, Leo G. Carroll reprised his role as Alexander Waverly and became one of the first actor to be in two series at the same time. By the way, the name of the character, April Dancer, was thought up by Ian Fleming when he was helping Felton draft the basic idea of MfU. At that time, the name was to be used for a secretary of Waverly, much like Miss Moneypenny was to M in the Bond series. That character was never used in the television series but Felton liked the name and, when the Girl From U.N.C.L.E. was created, he resurrected it. A gas that causes the victims to move in slow motion is going to be tested on a Greek island by Apollo Zakinthios. April Dancer goes there with a dog whose fleas have the antidote but then she loses the dog. To foil a plot by a Middle Eastern country's vizier to take control of the government by murdering the ruling sheik, April must disguise herself as a Princess. To get a man to testify in a case, they must find his missing daughter and bring her back to the States but a group of murderers have been hired to stop that from happening. April impersonates a murdered exotic dancer to ferret out a killer. The deceased had been couriering info for U.N.C.L.E. and her death may have been an inside job. THRUSH has a new device that can disrupt U.N.C.L.E.' world-wide communications. To stop them and destroy that technology, April must pretend to be a buyer of fashion and infiltrate a design house. After three rocket scientists are kidnapped, the clues point to a Mexican landowner named DeSada. April is sent to check him out but runs afoul of first his girlfriend and then the THRUSH operative running the show. The chubby but adorable crook innocently devoured a cheese danish which happens to be hiding a microdot of the major THRUSH weapon. That group wants to kidnap him and open him up. April must save him. Hoping to reincarnate a very long dead founder of their group, a cult's members plan to kidnap that leader's descendant and use a serum that may do the trick. Both THRUSH and U.N.C.L.E. want the serum. April takes the descendant's place. A professor who claims to have found the secret entrance to the lost Atlantis is kidnapped by THRUSH and April and Mark go to rescue him but get captured themselves. 10 The Paradise Lost Affair. While checking out a THRUSH plot to take over several South Pacific island nations, April and Mark get shipwrecked on an inhapited island and the leader there wants April to marry him. The matter reorganizaer beam is said to transport anything anywhere instantly and THRUSH has great plans for it. April is told to get it. The owner and operator of a small gypsy circus is killing people and April and Mark must join that circus to prove his guilt. A mobster is going to testify against his former bosses but he is being targeted by one of the best assassing THRUSH has. April is assigned to keep the witness alive. As April and Mark head towards an African nation rich in gems and jewels to help it protect what it has, another woman has already shown up pretending to be April. A major official in the government is in on the deception making things very difficult for the real pair. The evil looking Bubb wants to destroy the world's art collections and needs Professor Quantum's new machine, one that will pull the color from anything its rays hit. The order is to kill April because she knows too much about a crime boss but the killer who has a harem of his own in the Middle East decides she would be a great additon. The pill is called Vitamin Q and it gives the consumer super strength. The inventor, Dr. Toulouse, is extorting U.N.C.L.E., threatening to give it to its enemies unless a huge sum is paid. The Italian Prince has a scheme to rob the Vatican of its treasury. April learns of it but is captures. When mark rescues her, another young woman is endangered. April go-goes undercover as a dancer to find proof that THRUSH is sending in a killer to take out that nation's three heirs to the throne so the surviving Princess can be in charge. THRUSH agent Baroness Blangsted has a serum that provides rejuvenation for the wives of the leader of the world. She is using it to get them to influence their husbands. After obtaining a tape proving a soup canner is really a THRUSH agent planning to replace world leaders with doubles, Mark has the tape stolen by a woman who thinks Mark is a spy for her father. April must help him get it back. The winner of a race across Death Valley will win the rights to a mine which hold crystals great for lasers wanted by THRUSH. April is one of the contestants. The aging gangster wants one more big score and that involves stealing a country. To pull it off he must kill two people. April and Mark must make sure he does not. A popular European go-cart race is the locale for a THRUSH scheme to hijack a truck filled with U.S. currency. April and Mark head there to uncover who the masterminds are. The death of a crime boss at the hand of his own bodyguard starts April and Mark on the trail of a bodyguard school where the owners have a get-rich scheme that involves a high-stakes poker game and betrayal. Mark has to temporarily stash stolen THRUSH data in a car but when the car owner drives off, so does the data. Finding the info, the owner decides to sell it to the highest bidder. April and Mark are to capture a Japanese war criminal hiding in Hawaii. Looking for him, they also discover a submarine that was stolen earlier. One scientist has created a material which is spread by birds and can destroy all of mankind. Another scientist has created the antidote. They are both on a plane and the former is trying to kill the latter unless April as a stewardess can stop him. The trouble is she does not know who is who. To hideout while she is testifying in a case, April and Mark head to an English manor where the residents are out to commit murder to improve their inheritances. April and Mark are given the assignment of investigating a series of 'accidental' deaths of UNCLE agents. Reprinted in The Girl From U.N.C.L.E. Annual 1967. Something mysterious and dangerous is happening at a private school and April and Mark are told to find out what. 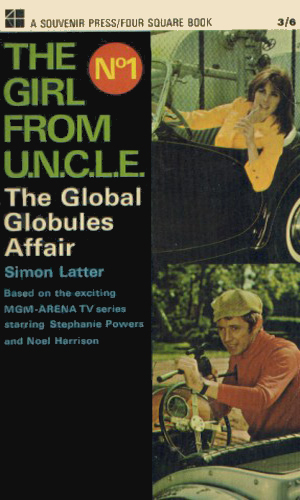 Reprinted in The Girl From U.N.C.L.E. Annual 1968. Pirates in the modern era? That is what April and Mark are told to go up against. Reprinted in The Girl From U.N.C.L.E. Annual 1969. While checking out leaks of military intelligence documents, April and Mark are taken captive by THRUSH. Something is going on in a fortification in the middle of the desert and April and Mark are given the job of infiltration. 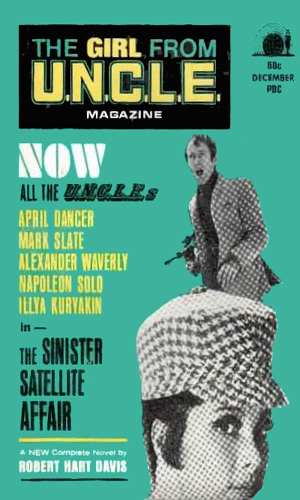 Just as its older cousin, The Man From U.N.C.L.E., there were further novella-length adventures which lay in the pages of a digest magazine which had two volumes, the first of 6 issues and the second apparently of just 1. Just as the MfU stories, they used the house name of Robert Hart Davis. Volume 1 in a 2 book series. The secret vaults have been opened and now the U.N.C.L.E. Photo Files are out. View never before seen photos of the U.N.C.L.E. Agents like Napoleon Solo (Robert Vaughn), April Dancer (Stephanie Powers), Illya Kuryakin (David McCallum), Alexander Waverly (Leo G. Carroll) and many others. All of the photo have captions by the author and the collection is vast within. Volume 2 in a 2 book series. The secret vaults have been opened again for a second time. Enjoy more captioned rarely seen image and photo of many of the U.N.C.L.E. Agents. 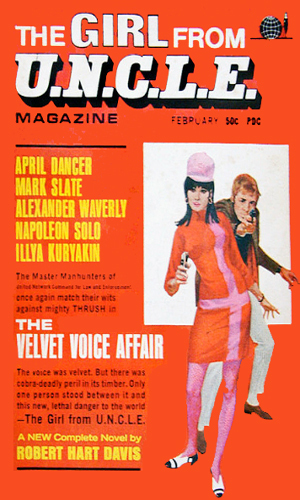 Again featured are Napoleon Solo(Robert Vaughn), April Dancer (Stephanie Powers), Illya Kurakin (David McCallum), Alexander Waverly (Leo G. Carroll) and many others. Another vast collection of photos. The television series did not go over too well with viewers. Oddly enough, the books fare considerably better. As a result, if you are a fan of the books put out in the MFU series, you will find the books in the GFU just as entertaining. When you read the books, keep the truly beautiful Stephanie Powers firmly in mind. It makes imagining the action a lot more enjoyable. Trust me, I know. Even the goofiest missions and lamest dialogue and coldest prose go much much better when Ms. Powers is involved.